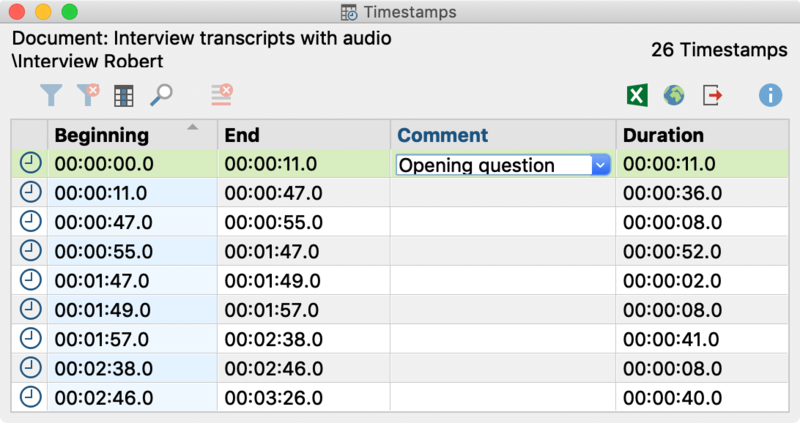 The Overview of Timestamps lists all timestamps in the currently opened transcript. To open this overview, click on the icon of the same name in the “Document Browser” toolbar. The Overview of Timestamps has as many rows as there are timestamps in the document, and every row has several columns. The first two columns contain the start and end points of that segment. In the third column, you have the option of writing in a short comment about that particular segment. The “Duration” column provides the length of the respective segment. This Overview of Timestamps table and the “Comment” column both function just like any other MAXQDA table. You sort the order of comments or search for a comment. Tip: To search for a comment, right-click on the “Comment” column header and select Search. If you are importing a document with timestamps, you still have the option to add new ones once it has been imported into MAXQDA. The option to write your comments in the list of timestamps also gives you a new way to find sections of your media file. You can use comments to organize and quickly access certain sections. Double-clicking on a row takes you to that section of the text in the “Document Browser” and starts playback of the media file from that point. Please note: Each transcript to which a media file is assigned contains at least one timestamp at position 0, the beginning of the document.